You can get your on line certification in just five simple steps. Please note - the American Physical Therapy Association (APTA) does not offer course-approval similar to that of ASHA. Because of this, EITTOC has applied for approval course-by-course to individual States, specifically – the State boards of physical therapy, or the physical therapy associations (PTA’s) for that State. 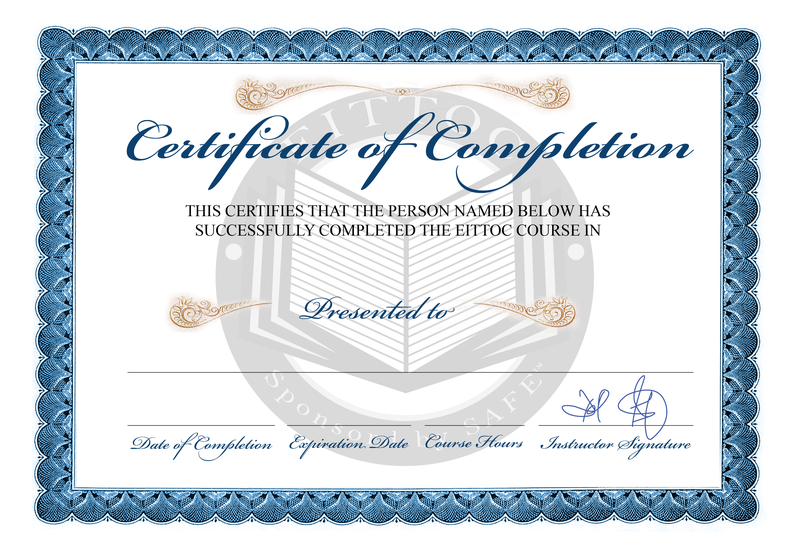 If you wish to know if your State recognizes any of EITTOC’s courses as approved as continuing education worthy of your State’s standards, view the course description of each course. If EITTOC’s PT logo appears on the course description of a course, please check to see if your State (board of PT or PTA, or Canadian province or territory) approves our course at: https://www.eittoc.com/pt-by-state.php EITTOC urges you to verify with your State board or PT association. OT Professionals - if the following AOTA logo appears in the course description – course is approved for CEU for continuing education for licensure renewal requirements. The onus of responsibility as to the appropriateness of course taken rests with each OT professional based on their contacting their individual State Licensing Board. Speech & Audiology Professionals - if the following ASHA logo appears in the course description - course is approved for CEU for continuing education for licensure renewal requirements. To view how many ASHA CEU's are awarded below the icon which lists exactly how many CEU's approved by ASHA. Log in – Enter your e mail address, select a password, and enter your name as you would like it to appear on your certificate. This is your permanent log on. There is no need to re-register for every course you take. Select your Course and Pay – “click on the course you wish to take from the course offering on the left. Study the Course – Don’t forget to take notes! Remember, you are not just reading, you are taking an actual course and will be tested in order to receive your certificate. Take the Test – When you begin the exam, you will not have access to the course material. Don’t be discouraged if you do not achieve a passing grade! Upon completion of the test, we will show you the correct answers to the questions you got wrong. You will then be able to review the course material again and re-take the exam. You have 3 chances to pass the test. If you do not pass, you will be able to view your graded test and see the answer key. Print your Wall & Wallet Card Certificate – When you pass the test, you can print your own certificate which will list the name of the course, your name and the date. You will receive a 7 days full membership to access the course and take the test! To attain your certificate of completion, you must register for the course by clicking REGISTER FOR COURSE.Most registrants complete this course in one to three hours, depending on how quickly or slowly your read, process and retain new information. You may take as long as you wish to study a topic. However, course work does not need to be completed in one online session. You can log off at any point and return to the course at your convenience. After completing the study module, you will be prompted to complete an examination. You must achieve a grade of minimum passing grade to become to receive our certificate of completion. Should you receive a grade lesser than minimum passing grade, you will be shown the questions in which you erred, with your incorrect answers highlighted in red; the correct answer will then be highlighted in green. Afterwards, you may re-take the examination again for two additional times. If you do not achieve a passing grade, you may purchase the course and take the test again. When you have answered the last exam question, the Course Results page will display. This page will contain your final grade and allow you to immediately print your certificate if you have scored a minimum passing grade which is 80%. Your certificate and wallet card will become immediately available for you to print it at any time. The number of test question(s) & assigned credit is calculated based on the content length, level of difficulty of material –both of which are assessed by peer review & pilot study; this is reflected by the number of test question in each course test: Ten (10) multiple choice question for the first credit hour, with no more than 10% true/false questions. For each additional credit hour assigned (after the first credit hour), five (5)multiple choice test questions are assigned – at a minimum. Our courses are designed so that you will receive your full color certificate IMMEDIATELY after completing and passing the course. Your official wallet card is also immediately available. Both are included in our price, there's absolutely nothing else to purchase! After completing and passing the exam, your full color certificate, suitable for framing, will be available for printing IMMEDIATELY! If you do no pass the first time, don't worry, you will be given plenty of time to go back and review the course material so that you can take the exam again. There is no additional charge to review the material or to take the exam as many times as necessary. We want you to take your time so that you can absorb the material fully. In fact, you can review the course material for up to 30 days and take the test over and over again, even if you pass the first time! After completing and passing your exam, you can print out you full color certificate IMMEDIATELY. Your official wallet card can be downloaded to your computer and is already signed and may be printed by you immediately. In this manner you can have an official card that you may carry with you at all times! 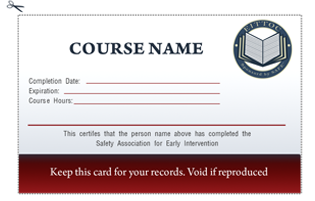 Each student who passes the exam will receive an official certification card, included in the course fee. There is absolutely nothing else to purchase! Describing the problem, difficulty, or criticism in the accompanying survey at the completion of each course. A response will ensue in which the user will be communicated with, imbued with graciousness and fairness embodying the courteous ‘service approach’ emphasizing a high priority to customer satisfaction and offering the consumer the ‘benefit of the doubt’ in determining whether the concern is legitimate and needs correction. If correction is needed, EITTOC will mobilize its staff to address the problem within 7 days or sooner, so as to resolve the issue/problem/concern, and take steps to prevent such a complaint in the future. 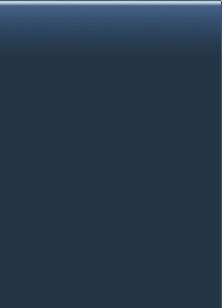 Full refunds are processed within 7 days of receiving refund request. Refund Policy - should provider receive complaints that the learner accidentally registered for the same course for a 2nd time, by accident, or any such permutation of error. Complaint resolution - involves communicating with any learner who forwards a complaint (such as difficulty in printing a certificate, turning off pop-up blockers, or difficulty accessing the course data, etc… (For example, should they have an old or lack a compatible version of Adobe reader, or if they must change browser). We provide them guidance on a 24 hour/365 day basis. Cancellation by Provider/Participant/User – If EITTOC cancels a particular course, we will notify the learner/student via email and issue a full refund, if they have already paid for the course. Cancellation by Provider/Participant/User – If a learner/user wishes to cancel a particular course, of which passing of that course awards professional CEU’s, learner may contact EITTOC via email to request a full refund within 7 days of receiving refund request.